For the first time in its 1,000 year history the highly-secure headquarters of The Royal Mint in south Wales is to welcome the public inside. A £7.7m visitor centre is to be built at the Mint's home in Llantrisant, Rhondda Cynon Taf. It is hoped up to 200,000 UK and overseas tourists will flock to the centre, which is due to open next year. Visitors will be able to see exactly how the coins are made and get the chance to strike their own coin. Bosses said the centre will be of interest not only to people in the UK, but also overseas visitors because coins and medals for around 60 countries are manufactured there. The centre will also safeguard 147 jobs within the commemorative division and create new jobs . 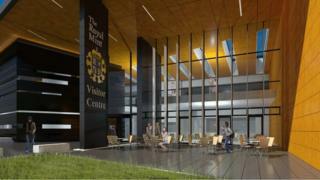 Shane Bissett, director of commemorative coins and bullion, said the centre would offer a truly unique experience, attracting interest from around the world. "The Royal Mint is a highly secure, Ministry of Defence-protected site which is not usually open to the public," he said. "We receive large numbers of requests to visit from members of the public every year and have been exploring the opportunity of a visitor centre for some time. "So, it gives us great pleasure to announce that this can now go ahead and people will be able to see the work of one of Britain's national treasures." Economy minister Edwina Hart confirmed the Welsh government would provide £2.3m funding for the centre during a visit to the Mint on Thursday. She said: "The new centre will be an all year and all weather attraction showcasing a unique product. "This project has the potential to be an iconic attraction for Wales."